The plant has long, thick, and sword shaped leaves. 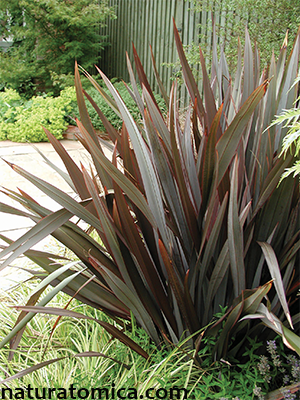 Growing from the base, the leaves are a dark and glossy green or sometimes with a brown tinge. The leaves are stiff, coarse and extremely strong. They grow to a length of between one and three meters and are between 5 and 12.5 centimeters wide. Flowers are large orange – red born on a central stalk, which is very variable in height and may be anything from 1.5 to 4.6 meters tall. The flowers are numerous and 2.5 to 5 centimeters long. After flowering, the seed capsules form, which 5 to 10 centimeters long, stout and usually erect, three-angled and become almost black when nearly ripe. The seeds are black, oval, and thin. The ripping period is mid- to late summer (January – February). 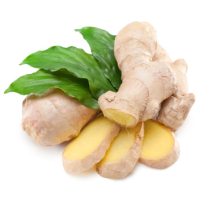 The root contains anthraquinones (laxative activity) and tannins (astringent action). The leaves contain gum (hemicellulose polysaccharides), with higher concentration in the vase of leaves. Another constituent of leaves is cucurbitacins, the chemical with cytotoxic/antitumour and anti-proliferative activity. The seed oil is rich in linoleic acid, which is an essential fatty acid. Root and leaves (only roots as alcohol extract). Astringent/hemostatic –this action has the effect of producing a barrier on the mucus or exposed surfaces, in other words an astringent contracts the tissues or canals of the body, thereby inhibits discharges, as of mucus or blood. Tannins are responsible for the astringent/hemostatic action. Laxative – play an important role in detoxification of the body by keeping the bowels working, so keeping this important channel of elimination open. Anthraquinones are responsible for the Harakere laxative effect. Antiseptic - inhibit the growth of and/or destroy microscopic pathogens. Emollient – soothe, soften, or protect skin. Antifungal - inhibit the growth of and/or destroy fungi. Anti-inflammatory - assist the body in reducing inflammation. Gastro-intestinal tract – constipation, flatulence, as well as diarrhea, parasitic, and mouth infections. External use – bleeding wounds, sore, and cuts; hemorrhoids. External use – wounds, sores, cuts, and burns. For burns, scalds and old sores, the demulcent gum from the plant - found at the base of the leaves - was softened in water and then applied to the skin. The red gum extracted from the base of the leaves was rubbed on the limbs of people who were suffering from sciatic and rheumatic pains. First, the limb was scored with a sharp shell. A blistered heel was cured by putting a softened piece of leaf in the heel of a sandal. When a person wanted to treat an abscess, the blanched base of a flax leaf was beaten to a pulp, heated, and applied to the abscess while hot to bring it to a head. The Maori used flax to relieve those suffering from rheumatism by boiling the broad base of the leaf and rubbing the warm liquid over the affected limbs. 1:2 Fluid extract 15-40 ml per week. The administration/use should be avoided in pregnancy. Due to the presence of anthraquinones, it is recommended to start at low dosage and increase it gradually. If taken as prescribed no side effects are expected. 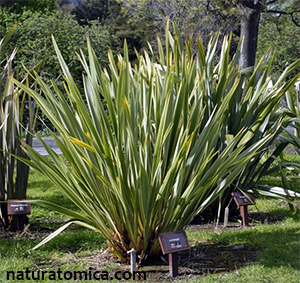 The New Zealand flax plant is one of the few native plants that is of economic importance. 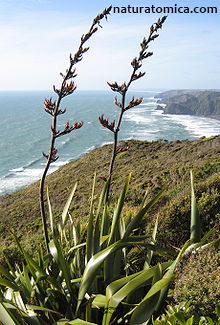 The Maori way of life revolved around the flax bush. The bush was taken care of by the village. Each variety of flax had a purpose, e.g., the tall flax was used for mat making and the short flax for making kete (flax bag). The flax leaves played an important role in spiritual healing. The leaves were used by tohunga to diagnose the health of a person. The leaves were also used to drive evil spirits out of a person’s body. During pre-European times, men were the gatherers of the flax. Before Cutting, prayers were offered to Haumiatiki, the god of uncultivated food. 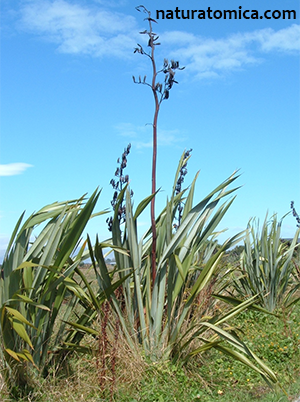 The flax plant is seen as a family (whanau). The leaf blades on the outside are the grandparents, inside these are the parents, and the heart of the flax bush (rito) symbolizes the children (kept safe in the center by the whanau). When harvesting flax only the outer layers are cut, the rito (center) should not be cut as this allows the regeneration of the plant. Flax should not be cut from the plant at night or in the rain as the leaves will be hard and difficult to work with. Flax must not be burnt. Unwanted leaves are tied together and left as the bush. Once kete is started, it must be completed. If it is not completed the weavers will not progress in their work. The first kete made must be given away. Bone, K. (2003). A Clinical Guide to Blending Liquid Herbs: Herbal Formulations for the Individual Patient. St. Louis, MO: Elsevier. Metcalf, L.(2009).Know Your New Zealand Native Plants.Auckland: New Holland Publishers (NZ) Ltd.
Rasmussen, P. (2008). Therapeutic uses of NZ native phytomedicines. Auckland: Phytomed. Riley, M. (1994). Maori healing and herbal. Paraparaumu: Viking Sevenseas.